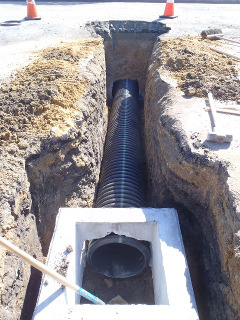 The storm water system includes approximately 16 miles of main lines, four Vortec units, and 178 catch basins. All basins were labeled with "Don't Dump, Flows to Bay." Currently, the District cleans the storm drains as needed as well as contracting with a private company and coordinating with Monterey County Public Works for street sweeping to help keep debris from plugging the storm drain system.